Expeditions in the infinite blue of the oceans have provided audiences with many a good listening experience down the years. From the likes of TITANIC to THE PERFECT STORM, to the swashbuckling adventures of THE PIRATES OF THE CARIBBEAN, the high seas have regularly exhibited memorable musical moments. With the occasional use of artistic license, cinema has been crafted in a mould that permits composers to produce scores of outstanding thematic content to accompany these sailing adventures, yet a documentary exists purely to convey real life. 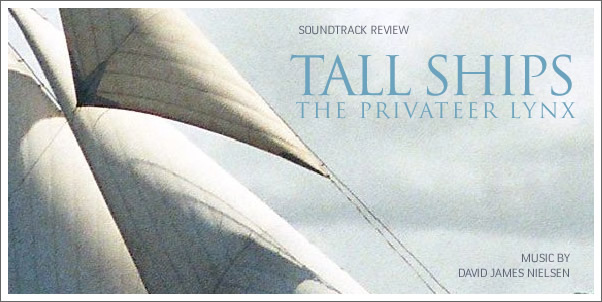 Are the bold themes of the sea-faring blockbusters attainable, or better yet appropriate for a production such as TALL SHIPS: PRIVATEER LYNX? DAVID JAMES NIELSEN’S music for TALL SHIPS answers that question with a somewhat indecisive answer. Whilst the music never achieves the thematic individuality of what one would expect from a major Hollywood film, NIELSEN has certainly crafted an evocative backdrop to the documentary.